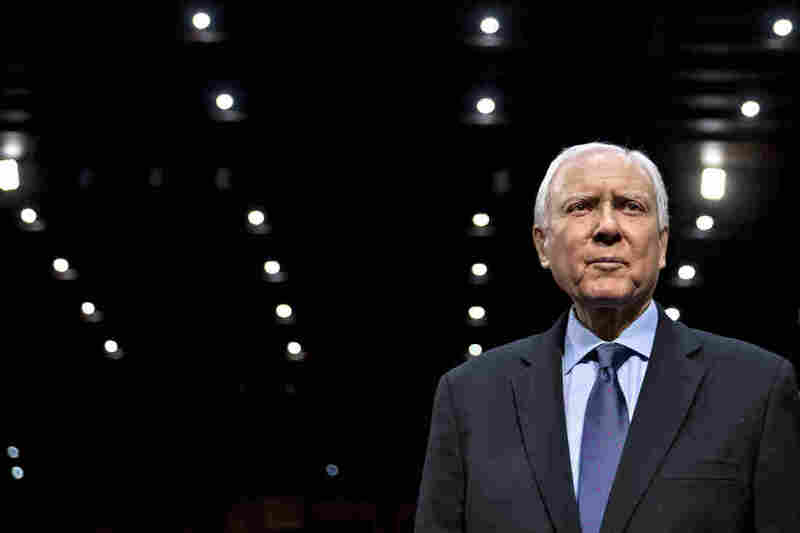 U.S. Health Care Was Shaped By Sen. Orrin Hatch's Sometimes Controversial Moves : Shots - Health News Republican Orrin Hatch is leaving the Senate after 42 years. He led bipartisan efforts to get health care for more kids and AIDS patients. He also thrived on donations from the drug industry. Sen. Orrin Hatch, a Utah Republican retiring from 42 years in the Senate as a new generation is sworn in, leaves a long list of achievements in health care. Some were less controversial than others. Hatch played key roles in shepherding the 1983 Orphan Drug Act to promote drug development for rare diseases and the 1984 National Organ Transplant Act, which helped create a national transplant registry. And in 1995, when many people with AIDS were still feeling marginalized by society and elected leaders, he testified before the Senate about reauthorizing funding for his Ryan White CARE Act to treat uninsured people who have HIV. "AIDS does not play favorites," Hatch told other senators. "It affects rich and poor, adults and children, men and women, rural communities and the inner cities. We know much, but the fear remains." Hatch, now 84, co-sponsored a number of bills with Democrats over the years, often with the late Sen. Ted Kennedy of Massachusetts. The two men were sometimes called "the odd couple," for their politically mismatched friendship. In 1997 the two proposed a broad new health safety net for kids — the Children's Health Insurance Program. "This is an area the country has made enormous progress on, and it's something we should all feel proud of — and Senator Hatch should too," says Joan Alker, executive director of Georgetown University's Center for Children and Families. Before CHIP was enacted, the number of uninsured children in America was around 10 million. Today, it's less than half that. Hatch's influence on American health care came partly from the sheer number of bills he sponsored or co-sponsored — more than any other living senator — and because he was chairman of several powerful Senate committees. "History was on his side because the Republicans were in charge," says Dr. David Sundwall, an emeritus professor in public health at the University of Utah and Hatch's health director in the 1980s. When President Ronald Reagan took office in 1981, the Senate became Republican-controlled for the first time in decades. Hatch was appointed chairman of what is now known as the Health, Education, Labor and Pensions Committee, which has oversight of the Food and Drug Administration, Centers for Disease Control and Prevention, and the National Institutes of Health. "He was virtually catapulted into this chairmanship role," Sundwall says. "This is astonishing that he had chairmanship of an umbrella committee in his first term in the Senate." In 2011, Hatch was also appointed to the influential Senate Finance Committee, of which he later became chairman. There he helped oversee the national health programs Medicare, Medicaid and CHIP. Hatch's growing influence in Congress did not go unnoticed by health care lobbyists. According to the watchdog organization Center for Responsive Politics, in the last 25 years of political campaign funding, Hatch ranks third among all members of Congress for contributions from the pharmaceutical and health sector. (That's behind Democratic senators who ran for higher office — President Barack Obama and presidential nominee Hillary Clinton). "Clearly, he was PhRMA's man on the Hill," says Dr. Jeremy Greene, referring to a trade group that represents pharmaceutical companies. Greene is a professor of the history of medicine at Johns Hopkins University School of Medicine. Though Hatch did work to lower drug prices, Greene says, the senator's record was mixed in the regulation of drug companies. For example, an important piece of Hatch's legislative legacy is the 1984 Hatch-Waxman Act, drafted with then Rep. Henry Waxman, an influential Democrat from California. While the law promoted the development of cheaper, generic drugs, it also rewarded brand-name drug companies by extending their patents on valuable medicines. The law did spur sales of cheaper generics, Greene says. But drugmakers soon learned how to exploit the law's weaknesses. "The makers of brand-name drugs began to craft larger and larger webs of multiple patents around their drugs," Greene says, aiming to preserve their monopolies after the initial patent expired. Other brand-name drugmakers preserved their monopolies by paying generic manufacturers not to compete. "These pay-for-delay deals effectively hinged on a part of the Hatch-Waxman Act," Greene says. Hatch also worked closely with the dietary supplement industry. The multibillion-dollar industry specializing in vitamins, minerals, herbs and other "natural" health products is concentrated in his home state of Utah. In the early 1990s there was disagreement about whether supplements should be regulated like foods or more strictly like drugs. "There was really no place for these natural health products," says Loren Israelsen, president of the United Natural Products Alliance and a Hatch staffer in the late 1970s. In 1994 Hatch sponsored the Dietary Supplement Health and Education Act, known as DSHEA. "It was necessary to have someone who was a champion who would say 'All right, if we need to change the law, what does it look like,' and 'Let's go,' " Israelsen says. Some legislators and consumer advocacy groups wanted vitamins and other supplements to go through a tight approval process, akin to the testing the Food and Drug Administration requires of drugs. But DSHEA reined in the FDA, determining that supplements do not have to meet the same safety and efficacy standards as prescription drugs. That legislative clamp on regulation has led to ongoing questions about whether dietary supplements actually work and concerns about how they interact with other medications patients may be taking. DSHEA was cosponsored by Democrat Tom Harkin, then a senator from Iowa. In his farewell speech on the Senate floor in December, Hatch lamented the polarization that has overtaken Congress. "Gridlock is the new norm," he said. "Like the humidity here, partisanship permeates everything we do." This story is part of a reporting partnership that includes KUER, NPR and Kaiser Health News.